Serious about input then why include all these archaic posts prior to Reply box? Japan until just very recently was far from Keynesian policy, they now see their mistakes thanks to Big Ben? NO you say to reducing gov spend we are back to levels of 09 and declining who’s the big gov lovers now? And BTW the libertarian way can never be achieved again of small unregulated gov because the wolves and foxes are now watching the chicken coop as proof of our great deregulatory recession after fleecing Americans. Ramble on Dan even if only for confusion and misinformation? And Again you stereotype of supply siders is no stereotype it’s the closest accuracy you have. It shocks me to consider the state of this “hot mess” that evolved from the country where I grew up. It’s is a depressing mess and it appears there is nothing to be done to tip the scale back to sanity. I’m 53 and looking around for somewhere else to call home. Our own government has turned against us like a desease destroying its host body. A good read. And posted on my birthday! Calvin Coolidge had it right, and doesn’t get the proper respect. Under his administration he; cut taxes for all, stopped immigration until unemployment was at an exeptable level, and most important, lowered the national debt. The results; the economy grew, unemployment dropped to around 3%, and he lowered the natioal debt by almost 30%. Pretty good example of effective government that is not used today. We need another Coolidge. Forgot to put the website.. Sorry. Fairtax.org is the official website. The Fairtax is the solution your looking for good sir. I am not holding my breath; Congress and the president wield so much power through the tax code that it’s hard to imagine enough of them having the courage to forfeit it for the good of the country. It seems like the differences here stem from where each of these groups of folks believe wealth and prosperity originates from. For Libertarians this is either a foundation principle or fantastic outcome of their morally-chosen philosophy (I always wonder if they would still choose it morally, though, if it didn’t have this great side effect). Keynesisans don’t seem to give it some thought. They seem to think they can trick the process. The source of wealth creation doesn’t even seem to be on the radar for IMF’ers. I think supply-side thinking comes out of despair that we will ever be able to actually reduce government unless we are forced to by creditors. Wasn’t it Reagan who talked about the need to “starve the beast?” And when asked whether a surplus should be used to reduce debt or cut taxes, Milton Friedman said cutting taxes was the only answer because government would find new ways to spend it rather than reducing debt. Starving the beast through cutting taxes may be our only way to slow government growth because China will eventually decide we’re not a good risk. I think you have it exactly. More government is never a solution, only more of a problem. Increasing tax rates will not lead to increased revenue, only to less business, jobs, investment. Obama and company are keeping the economy boat afloat by drilling holes in the bottom. No one can convince them it will not let the water out. As GW Bush with Chuck Grassley’s and many other Republican partiers’ support signed a tax bill that increased overseas Americans’ tax liabilities, there likely should be an asterisk on the second column entry at “Stereotype . . .” row. A check-minus to him for having picked on an unrepresented minority of Americans and also thereby promoting the hiring of Australians, Canadians and Englishman (none of whom have tax liabilities back home for income earned offshore) at nominally US companies with operations abroad. How about the GWB / Cheney Theory summed up as, “Deficits don’t matter” against the rising tide of revenue theory with receipts covered spending of the good supply side? I think the Keynesian approach definitely depends on the condition of the economy. In prosperity, the government should give the market relatively free reign (many Keynesians tell us). But when the economy need stimulus, the government needs to step in. 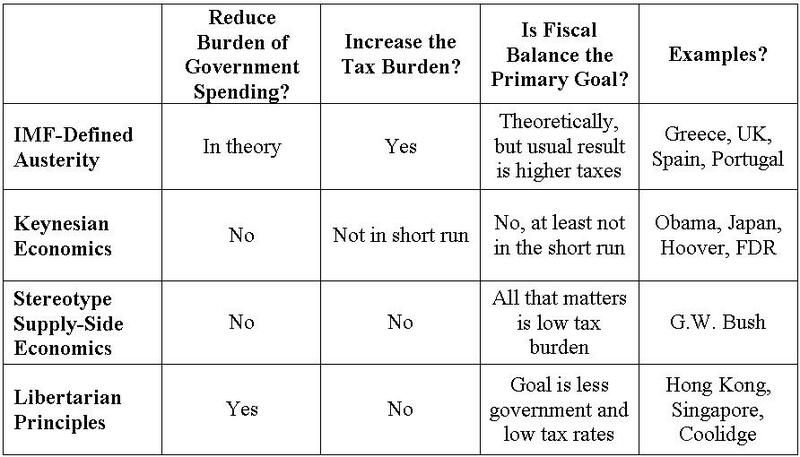 Keynesians would tell you to run a budget deficit in times of economic hardship, but not to do so in times of prosperity (Clinton is a good example).